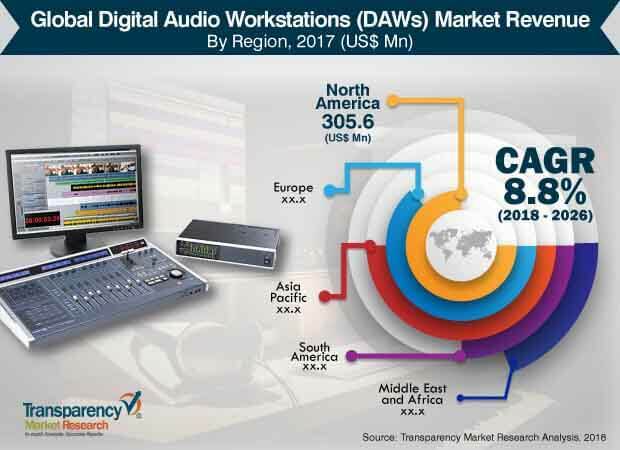 According to a new market report Digital Audio Workstations (DAWs) Market, published by Transparency Market Research, the global Digital Audio Workstations (DAWs) Market is expected to reach US$ 1,486.0 Mn by 2026, expanding at a CAGR of 8.8% from 2018 to 2026. According to the report, the global market will continue to be influenced by a range of macroeconomic and industry-specific factors. North America will continue to be at the forefront of global demand, with the market in the region growing at above 8.2% through 2026. Technical advancements, increased digitization and presence of large number of digital audio workstations manufacturers are anticipated to significantly influence the global digital audio workstations market growth across the North America region. Increasing adoption of DAWs system for recording, editing and producing audio files is expected to boost the growth of the overall market in the coming years. The ability of DAWs software to offer cost effective and efficient recording system is fueling demand for them. Apart from that, easy availability of free learning materials on different website is expected to boost the demand of DAWs software across the different application area over the forecast period. In addition, music composition or creation of electronic music with little investment in computer or digital device is expected to fuel the growth of the market in the coming years. Furthermore, increased presence of number of digital audio workstations manufacturers and post-sale service providers across the regions has led to subsequent rise in demand of digital audio workstations and which is likely to supplement the market growth during the forecast period. In terms of digital audio workstations system, both North America and Europe are matured market owing to high awareness among the users and technological development. However, South America is expected to witness strong growth during the forecast period from 2018 to 2026. Rising penetration of technology as well as significant investments in music production from media and entertainment industry across the countries such as the U.S., UK, Germany, France, China, India, South Africa and Brazil among others is anticipated to offer prominent opportunities for digital audio workstations providers in the near-term. The global digital audio workstations market is broadly segmented by component into software and services. According to the research study, the software segment of the market held the maximum market share and is anticipated to remain dominant over the forecast period in terms of revenue. The software segment is further sub-segmented into stand-alone and suite. Among the sub-segment, suite segment accounted largest market share globally followed by stand-alone in terms of revenue. Moreover, suite software based digital audio workstations segment is expected to expand significantly over the forecast period. Service segment is also further categorized into system integration and operating and maintenance. Among sub segment, operating and maintenance accounted major market share of global digital audio workstations (DAWs) market and is projected to maintain its leading position over the forecast period. The research study includes digital audio workstations market analysis by regions segmented into North America, Europe, Asia Pacific, Middle East & Africa and South America. Based on OS compatibility of digital audio workstations, MAC OS segment accounted the major market share in the global market in 2017, followed by Windows OS. However, Mac OS segment is projected to expand at a significant pace during the forecast period from 2018 to 2026. On the basis of deployment, the global digital audio workstations (DAWs) market is categorized into on-premise and cloud. As per the research study cloud segment accounted the leading market share in 2017 and is expected to retain its market dominance over the forecast period. Moreover, this segment is projected to expand at a significant pace during the forecast period from 2018 to 2026. The digital audio workstations (DAWs) market is also segmented by end-use sectors into commercial and non-commercial. Commercial sector is segmented into professional and music industry. Commercial segment accounted the major market share in 2017 and is projected to expand significantly over the forecast period due to wide adoption of DAWs software among professional music producers such as DJs, gaming, and video production house among others. On the other hand, non-commercial sector is further categorized into education and enterprises. North America held the largest market revenue share for digital audio workstations (DAWs) market in 2016 and is anticipated to grow at CAGR of 8.2% during the forecast period. Analyzing the North America digital audio workstations (DAWs) market at country level, it is expected that the U.S. held the majority of revenue share of the North America digital audio workstations (DAWs) market followed by Canada in 2016. However, in terms of growth rate, South America and Asia Pacific is anticipated to show strong CAGR over the forecast period. The research study includes profiles of leading companies operating in the global digital audio workstations (DAWs) market. Profiles of market players details on company business overview, broad financial overview, business strategies, and recent developments. Some of the key players in the digital audio workstations (DAWs) market as profiled in the study are Ableton AG, Acoustica, Inc., Avid Technology, Inc., Cakewalk, Inc., BandLab Technologies, Presonus Audio Electronics Inc., MAGIX Software GmbH, Steinberg GmbH, Adobe Systems, Inc., and Mark of the Unicorn among others.